Lithograph from Adolphe Duperly's 'Daguerian Excursions in Jamaica.' 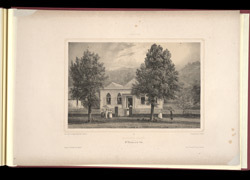 It shows a small Methodist chapel in St Thomas in the east of Jamaica. The Wesleyan Methodists first arrived in the West Indies when Thomas Coke was blown off course on a voyage to Nova Scotia in 1786, and landed in Antigua. Methodist missions and chapels were soon to be established on more of the islands.